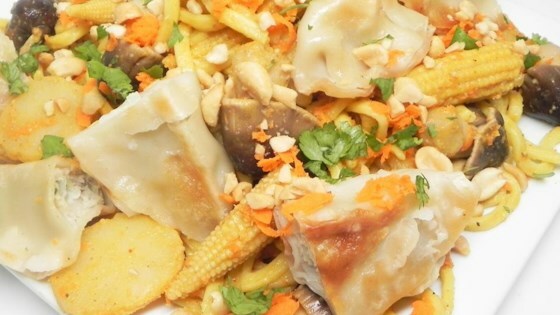 "Vegetable potstickers and egg noodles are tossed with peanut sauce, water chestnuts, and baby corn." sooooo tasty...I substituted sweet potato noodles for the egg noodles. And I had some left over chicken that I included. This will be a recipe that will be used again. I made this with seafood mushrooms and snow peas instead of carrots and corn, also I used Chinese egg noddles too. We loved it.